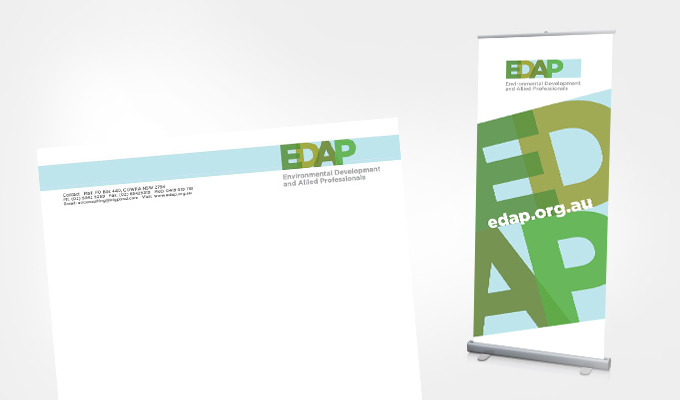 EDAP were looking to gradually update their look and feel, beginning with a logo re-design. While they liked elements of their original logo [we did too], they were looking for something more professional and a little more corporate, to better reflect the image of their growing organisation. A letterhead template and pull up banner design followed. 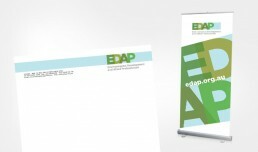 EDAP is a multidisciplinary organisation that offers membership to environmental planners, health, building and allied development assessment professionals from government and the private sector. The logo is designed to reflect the various sectors and the myriad services they cover. We began with the structural / landscape concept of the existing logo [which used the acronym to resemble an aerial view of land in perhaps a planning grid] and looked at different ways of communicating this. The new design uses bulkier, squarer in proportions letterforms overlapping to form another sort of grid, again implying topographical imagery / planning stage drawings and mockups. Overlapping colours represent services which blend across industries. The slightly muted colour scheme and crisp lines are more reflective of the group’s aim to provide state of the art information on the management of the built and natural environment. For versatile application on further materials, the logo container is designed to bleed off the page in some instances, becoming a graphic element in the overall brand. You can see this in action on the letterhead and pull up banner below.